On 4 November 2009, an Ameriflight Beech C-99 aircraft (N330AV) was cruising at about 11,000 feet in the vicinity of Show Low, AZ when one or more birds struck the aircraft and penetrated the windscreen. 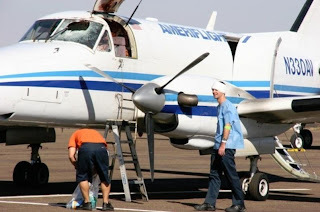 The pilot, who was the lone occupant of the cargo aircraft, sustained minor injuries to his face and shoulder and was able to land the aircraft without further incident at Show Low, AZ. For additional photos from this incident, please visit BirdStrikeNews.com. Warning: Some of the photos on the BirdStrikeNews.com article may be very disturbing to some viewers.